I spoke to Carine during a street style shoot outside of a nyfw show back in 2007. Just chatting with her for 3 minutes was incredibly inspiring and informative. This event should not be missed! See a sneak peek of Carine Roitfeld: Irreverent , out October here. Spotted: Leaving Diane von Furstenberg’s f/w show. My second encounter with the always lovely Carine. 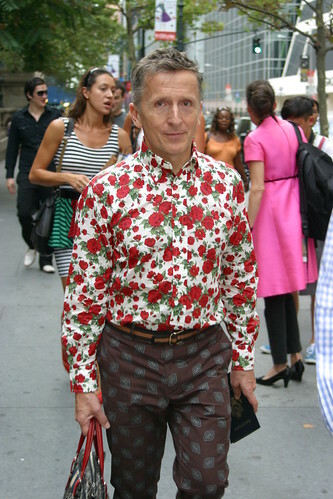 Back in my days as photo assistant at now defunct Page Six Magazine, I also worked as a street style photographer during fashion week, documenting the outfits of attendees. I’m hoping my newly acquired “free time” continues up to this fall’s shows, so I can do it once again. We accidentally ran into Agyness outside of Bryant Park, traveling between shows. She was extremely accommodating, and very down to earth when I took her photo and my editor interviewed her. We also had a chance to speak to her adorable mother, and I believe her cousin from the UK, who were attending their first fashion week with Agyness. I regret not taking a photo of her mother, who was beyond sweet. Carine Roitfeld (in Balenciaga) told us about her days as a muse for YSL. She was also very nice, and very humorous! Taylor was very gracious, and very excited to be attending her first fashion week. At 14!!! She and her mother remembered me, and stopped to say hello. I’d spent the previous day on set with the female stars of Gossip Girl, as they were the cover stars of Page Six’s inaugural issue. All 3 of the leads were a pleasure to work with, but wise beyond her years Taylor was definitely my favorite.